Being complimented for weight loss means you are contributing to fatphobia. 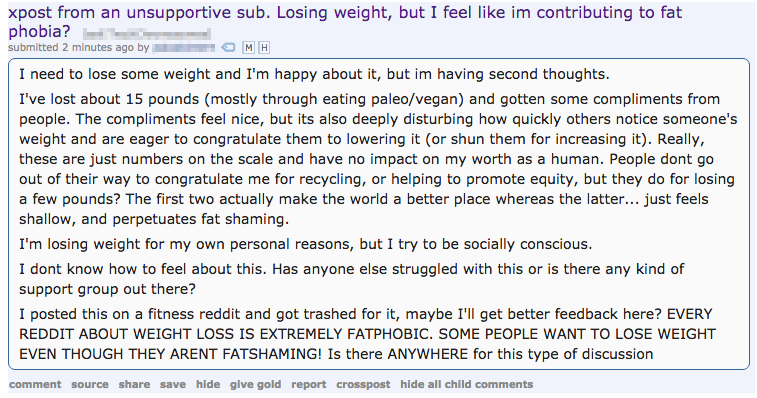 Also every weight loss sub is fatphobic. This comment was posted to reddit on Sep 02, 2017 at 5:22 pm and was deleted within 11 hour(s) and 4 minutes. This is what happens when you convince yourself that the world is out to get you because of "something you can't change*". What's so great about having to watch every little step you and other people make? You can't even enjoy personal achievements or compliments without worrying about being 'kicked out' of a group that's doing little to nothing good for your well-being. People congratulate others when they show hard work and dedication. Losing weight requires both of those. Gaining weight, as most people already know, is simple. Would you congratulate someone for doing something that everybody else can** do? No. You wouldn't. Really, these are just numbers on the scale and have no impact on my worth as a human. That's exactly right! But you believe that's what all the skinniesTM believe because that's what your cult group told you. I'm losing weight for my own personal reasons, but I try to be social conscious. Good for you! Really! But stop thinking about what other people will say about you. Life is too short to be worrying about that. It's not a bad thing to put yourself before other people. You've already did the "impossible" by losing 15 pounds, which isn't a little btw. Let's say you reach whatever your goal is and everyone in you cult group goes all out on you. What would you do? Gain it all back to be accepted again? Or leave? I'm pretty sure most people will agree that it's a lot easier to change* yourself than it is to change everyone else. *change: as in, something that is actually possible; not like "changing your race or sexual orientation". **can: in this case, "can" should not be mistaken as "able".